There is at least one certainty at the end of the second week of the Synod of Bishops: the bishops, with almost no exceptions, do not like the Working Document (“Instrumentum Laboris”) that the Synod’s General Secretariat prepared as a basis for the Synod’s work. This is demonstrated by the small group (“circuli minores”) reports concerning the second part of the Working Document. The reports were published last Wednesday. Out of 13 small groups, 11 have asked for a substantial rewriting of the second part of the document. Two of the small groups went beyond this, and materially rewrote the second part. One of the small groups asked for a magisterial document in order to clarify once and for all the teaching of the Church on marriage and family. It is noteworthy that the 30 paragraphs of the second part of this document are not those most questioned. They deal with “Family in the Socio-Economical Context.” The hot issues are contained in the third part. This is the reason the negative outcome on the second part should not be underestimated. The real debate is not about procedures. It is mostly about the way the Synod’s General Secretariat has drafted the document. We have moved beyond the mere issue of procedures. Since the beginning of this Synod, almost all of the small groups noticed a lack of references to Scripture or to the Church’s tradition. The same issue was raised at the 2014 Synod, and the Final Report was then completed with paragraphs including passages from the Bible. Not by chance those paragraphs were the only ones that gained a “qualified (2/3) majority” from the assembly. Language is another issue at stake. But not in the way everyone expected. Language is not an issue in the sense that the Church should find a new way to express its ideas by adapting them to secular language and the new requirements of social communication. The reports rejected this view. The real problem – as the bishops maintain in the small group reports – is that the language of the Working Document is already far too adapted to secular language. In fact, from these reports one can deduce one grave error: this kind of approach does not read the signs of the times; it turns the signs of the times into a kind of new divine revelation. This is the typical mistake of much theological work published after the Second Vatican Council, and certainly it is the mistake of liberation theology. Following this mistaken approach leads to some unavoidable consequences: indissolubility is perceived as a too difficult a word to be understood; the Christian ideal might be too heavy a burden; mercy helps people to live a more joyful life. These sentiments are what lies behind the wording of the Working Document. What is the bishops’ approach? In fact, the majority of bishops do not agree with this approach, as can be deduced once again from the small group reports. In the end, each of the small group reports asked for more positive language to speak about the family, because the Working Document speaks mostly about the difficulties facing families. Pope Francis’ line probably favors a more positive approach, and this is paradoxical, as the suggestion comes from a wing that he does not seem to support. But there is a huge bias present in most descriptions of Pope Francis’ ideas. What he is convinced about is that the Church must convert people through attraction, and he has repeatedly insisted that a Christian must be joyful, and not confined by rules. He did not ask Christians to abandon law, but to live the law with joy. Joy is the key, but those who try to adapt doctrine to the signs of the times have still not understood it. Where will Pope Francis stand? Certainly, Pope Francis understood it. He is very satisfied with the frank and open discussion of this Synod. At the same time, he can barely stand it anytime there is a whiff of “conspiracy theory.” He denounced the “hermeneutic of conspiracy” because he felt some uneasiness around him. This uneasiness was probably generated by those who are at risk of being disappointed by the Synod’s conclusions. There is the strong risk of a “Humanae Vitae effect” in the possibility that Pope Francis, in his final speech, will downplay the hoped-for changes in doctrine, and will instead reaffirm the doctrine of the Church, perhaps with the concession of a greater emphasis on pastoral care. More mercy in confessionals, in the end. This outcome would contain another paradox, as Pope Francis’ main ally might turn out to be Cardinal Petr Erdo, General Relator of the Synod of Bishops. His introductory speech was precise and straightforward. In this way, he laid solid foundations for what followed, and the Pope will probably build on them. The speech was considered too conservative by the circles who are hoping for substantial changes in the doctrine of the Church. In fact, the speech has given the Pope the possibility for a small step forward. Basing himself squarely on Erdo’s introductory speech, the Pope can cautiously open to something new in pastoral terms. It will not be a big step forward. But this will help the Pope not to appear as one who has frozen an ongoing process of change. 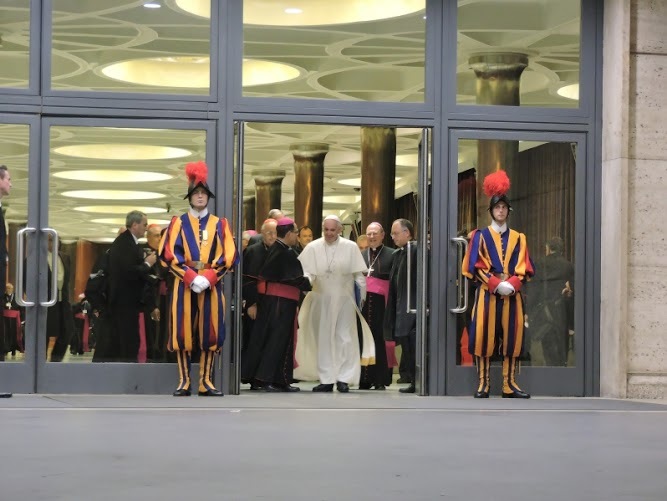 While bishops discussed content, there was a real war of information going on outside the Synod hall. All the attention was focused on the letter that 13 cardinals sent the Pope at the beginning of the Synod, expressing their concern over Synod procedures. It is not worthwhile to trace back in detail the story of the letter. Just a short summary. At first, it was made known that there were 13 cardinals complaining with the Pope about the Synod procedures. The letter was then published together with the names of the cardinals who allegedly signed it. After publication, four of the cardinals denied having been among the signatories, while the other ones said the content of the letter was not correct. Then, a new list was published, and still one cardinal from the new list denied he had signed it. But this is not the center of the issue. The real issue is: why was it leaked at first that there were 13 cardinals who spoke out about the Synod’s procedures? Why was a partially incorrect version of the letter leaked? And why did the leaked list of signatories include the names of cardinals who never signed it, or even took part in drafting it? All of these questions point to dirty tricks behind the Synod. The goal of this dirty game was to hide in the background the real issues at stake at the Synod. Sending this letter was an act of loyalty to the Pope, since the criticisms and concerns were not expressed in public, but on the basis of the signatories’ personal relationship with the Pope. But the alleged signatories of the letter are not among the media favorites, because they support a Church faithful to doctrine. So, if their personal relationship with the Pope had become public, the narrative constructed around the Pope would fail. According to this narrative, anyone who is against a certain view of the Church – represented by Cardinal Walter Kasper’s views on divorced and remarried – is against the Pope. Cardinal Gerhard Ludwig Mueller, Prefect of the Congregation for the Doctrine of the Faith, described this scenario as “a new Vatileaks,” and charged in clear terms that its aim was to divide bishops and cardinals. But not even these words of Cardinal Mueller were able to withstand the counter-information machine. Opinion leaders immediately made a distinction: Vatileaks was an operation by underlings against the Pope, but the letter represents an operation by Cardinals against the Pope. Pope Francis, a man alone against his enemies? In the meantime, the same narrative pits Pope Francis alone against everyone, even lobby groups. This way, the personalization of the Church is elevated to the highest ranks. The Church has always been under attack by political and economic lobbies (take, for example, the battles at the UN Conference on Woman in Beijing, or the campaign to reduce the Holy See’s status at the UN to that of an NGO instead of a Permanent Observer). But a recently released book endorses the narrative that Pope Francis alone has aroused the hatred of lobbies, and it describes all of these lobbies as conservative. This narrative is good neither for the papacy nor for the Church. In fact, the Church is neither pro nor contra when it comes to conservatives, and any other polarizing reading of the Church’s position is misleading. The Church is the Church, and has its own patrimony of doctrine and social teaching that makes of it a body “super partes,” whose aim is the common good. But the Church is completely pushed aside in this war of information. In fact, many consider the Synod a test for the long-awaited reforms of the Curia that are still under discussion. Yet it seems that no big revolutions are in the offing. Pope Francis is not much interested in organizations, nor he is interested in putting into action a huge spoils system. How does the Pope govern? The Pope established a sort of parallel Curia; he has his meetings and private conversations with people he trusts. This is the same way he is conducting the Synod of Bishops. Meeting bishops and friends, and taking part in the Synod’s work, Pope Francis became aware that the Church is probably more extensive than what he could have perceived from Argentina. None of the bishops denies the need for pastoral care. But bishops are extraordinarily united in requesting a clear doctrine and a real ideal so that the Church does not give up shaping the world with the strength of the Gospel. This is what the African bishops are asking for as they meet every two to three days in order to discuss how the Synod is going. This is what the North American bishops – with some exceptions – are asking. Even the South American bishops are in part backing this view. As far as Europe goes, this same request is advanced by Italian, Spanish, and even French bishops – though one of the French bishops took part in the so called “Shadow Synod” in Rome on May 25. In fact, the so called “Shadow Synod” was no more than one of the periodic meetings held by French, Swiss and German bishops’ conferences. The German Bishops’ Conference does not like the journalistic phrase “Shadow Synod”. Labelling the May 25 meeting – and the following September 10-12 meeting – as a “Shadow Synod” might seem superficial and incorrect. However, the texts of the speeches at those meetings reveal a clear orientation toward the Synod’s topics. And the German bishops organized it. Unlike the other groups, the German small groups did not ask for a substantial rewriting of the second part of the Synod’s Working Document. At the same time German bishops are trying to find new leverage. In their last report, they use quotes by Thomas Aquinas in an attempt to ground their point of view on the thought of one of the Church’s doctors. Cardinal Reinhard Marx, President of the German Bishops’ Conference, issued on October 16 a statement in which he (forcibly) grounded in the writings of John Paul II and Benedict XVI the possibility of granting access to sacramental Communion to civilly divorced and remarried Catholics. The fact that the German bishops are seeking for a theological justification might be interpreted as a sign of weakness. They know their positions are not shared by the majority of the assembly. In the meantime, the Synod’s discussion quickly develops. Bishops have many ideas, they are well prepared, and many of them are trying to take the floor. The Pope is seemingly very happy about that, while he was annoyed earlier by the “conspiracy theories”. This more relaxed situation weakens the circle around the Pope, since they fed the conspiracy theory and pushed the Pope to respond publicly to the concern expressed in a private letter. The discussion proves that bishops are beyond any conspiracy. They are continuously seeking for a real pastoral care for the family, based on firm and clear doctrine. This approach cannot be ignored. This is the reason that the possibility of a post-synodal exhortation – that is, a final document issued by the Pope after his reflection on the Synod results – has come back. Fr. Antonio Spadaro, SJ, one of the closest papal collaborators, Editor of the Jesuit-run magazine “La Civiltà Cattolica”, issued 40 key points that came from the small group discussions concerning the second part of the Working Document. Among these key points, the possibility of a post-synodal exhortation is contemplated. This is food for thought, as the 40 points Fr. Spadaro highlighted might be the basis for the Final Report that will be submitted for the Synod’s consensus and then given to the Pope. The post-synodal exhortation would be a brand new document – the Synod’s Guidelines (“Lineamenta”) and the Working Document were not new documents, as they were based on the controversial 2014 Synod Final Report. This new document would collect original contributions and would bring the Church toward a new era. However, the issuance of an exhortation would be a defeat for those who have conceived the Synod’s new procedures. Procedures are not neutral, as the history of the Second Vatican Council teaches. Through procedures, decisions might be contrived, discussions might be raised, and some topics can be more emphasized than others. 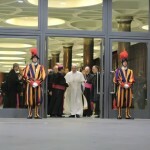 According to some internal observer, this Synod’s procedures were conceived with the precise notion of isolating some positions, deemed more conservative. This was already clear in the 2014 Synod: the Mid-Term report was not shared by the majority of bishops, and the Final Report was considered the less bad solution possible. For the 2015 Synod, many of the issues already rejected by the bishops had been revamped in the Working Document. The Church however is larger than procedures, as the history of the Second Vatican Council proves. A quick glance at the “Diary of the Council of Msgr. Pericle Felice,” edited by Archbishop Agostino Marchetto, would help us to understand that many of the Synod’s issues today were already current during the Second Vatican Council. That time, a major Pope, Paul VI, a martyr of the Council, brought the Church back to unity, and was able to move beyond the council of the media – as Benedict XVI called it. Today, Pope Francis is called to do the same. There is a difference. Pope Francis must watch out for those of his friends who pretend to be the only faithful interpreters of his thought. For this reason they have gained important positions and influence in the Church. Pope Francis’ fate is not merely that of being a guarantor. His fate is that of giving a precise swing to the Church. The majority of bishops is expressing its suggestions. But Pope Francis will be the only one to make the final decision, as he acknowledged in his speech at the commemoration for the 50th anniversary of the Synod of Bishops. Dankenswerterweise haben Papst Johannes Paul II. und Papst Benedikt XVI. keinen Zweifel daran gelassen, dass auch zivil geschiedene und wiederverheiratete Gläubige zur Kirche gehören, und sie wiederholt eingeladen, aktiv am Leben der Kirche teilzunehmen. It says nothing specifically about the reception of Holy Communion. What it says is that the papal magisterium insists that the divorced and civilly remarried belong to the Church and should be invited to take an active part in the life of the Church.